We finally got our first real snow fall over the past two days so it is looking like a winter wonderland around here. Not only that but a lot of the packages have started to arrive from all my Black Friday online shopping so I'm feeling like one of Santa's elves hiding them away in preparation for wrapping and gifting. 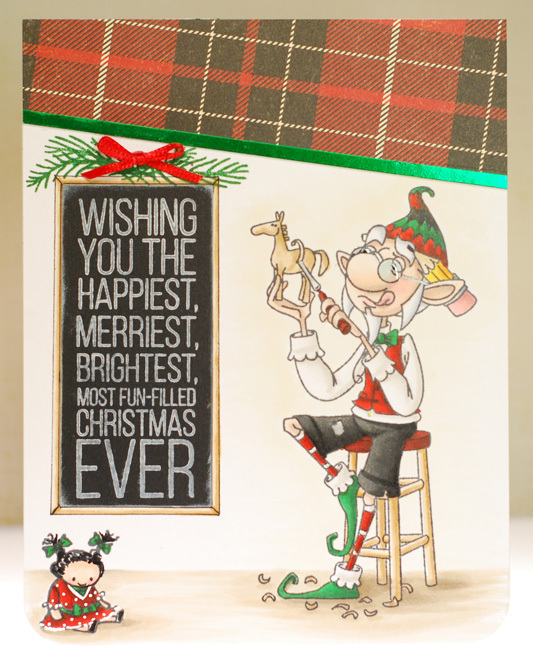 I guess that's why I grabbed Toymaker Elf from Kraftin' Kimmie Stamps for my card today as he seems to be busy getting ready for the big day too. At first I just had him stamped on the cardstock with the sentiment beside him in black but as I started to put the card together I decided to re-stamp the sentiment on black to make it look like a chalk board hanging in the workshop. I drew a frame around it and stamped some pine boughs on top to really complete the look. The scene still needed something, so I grabbed the little doll accessory stamp that came with Charlotte and altered her a bit to be less creepy and more cutsie... perfect! And I'm going to go ahead and enter this in to the 'anything goes' Wednesday challenge on the KK blog. oh my goodness........it's Fabulous looking!!!!! The doll looks amazing too!!! Brooke LOVES plaid!!!! We love how it turned out!!!! This is just fabulous!! I love how you added the doll in the corner and the plaid paper! Thanks so much for joining us this time at Kraftin' Kimmie Challenges! He's adorable!! Thanks for playing along with Kraftin Kimmie, hope to see you again!